If you’re a mom and find your once good-natured, cooperative son defying almost everything you say, you’re not alone. Is he a freshman or sophomore in high school? High school teachers will tell you something their middle school counterparts may not experience: Along with puberty, many young men struggle with female authorities. Of course, not all boys enter adolescence at exactly the same age, but when those physical changes do come, a change in disposition may come, as well. The fact that your son has hit puberty doesn’t mean you just have to stand by helplessly or assume that this “rebellious” streak comes with the territory of having a teenage son. While noncompliance or disrespectful words and nonverbal reactions shouldn’t be excused, inviting them can be avoided. 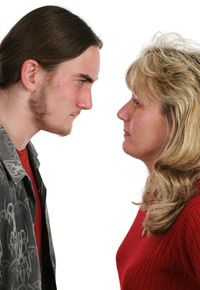 By finding ways to affirm his masculinity, avoiding direct confrontations, and allowing him some flexibility, you can at least reduce the tension that has entered the once peaceful mother-son relationship. Sure, it’s hard to think of your “little boy” as a man, but that he is—or is becoming. As a young man, he naturally feels compelled to assert his masculinity; unfortunately, that may come in the form of resisting female authorities. Even though he still needs to respond to you and other women with respect, he also needs some affirmation. Do you notice his leadership among his peers or siblings? Has he taken initiative to provide for or protect others, in some way? Those are positive traits that you want to encourage. By recognizing his emerging manliness in those areas, he may feel less compelled to assert it in other ways—namely, questioning or defying your authority. In some ways, this idea goes hand-in-hand with affirming your son’s masculinity. If you correct him in front of his peers or in a way that completely shuts him down regarding an area about which he’s passionate, you’re kind of picking a fight. If he already has strong emotions about something or has been trying to assert leadership among his peers, your confrontation will basically invite him to argue with you. Instead of turning the issue into a power struggle, you may want to try tabling it for another time when less emotional energy is likely to surface. Especially if your son has younger siblings and your parenting style is on the rigid side, consider being a bit more flexible with the young man or men in your home. As long as he’s under 18 and/or under your roof, he’s your responsibility, so having expectations for him certainly makes sense. However, when you allow him some flexibility and independence amid his responsibilities, you allow him to mature in ways that he needs to do. By finding ways to affirm your son’s masculinity, avoiding direct confrontations with him, and allowing some flexibility in how and when he fulfills your expectations, you’ll be showing him that you support his newly-found quest for manhood and that you’re still on his side.